Dolley with her Ukraine Sisters-in-Christ, Tanya and Luba. "Man plans and God provides." Oh how true that has been on my mission trips to Ukraine. It's been my blessing to minister five times in Kiev and it's bordering cities. While there with my husband, we taught at conferences for leaders, mentored pastors and their wives and other married couples, and lead Bible studies. Twice I traveled by myself and ministered to women, singles, University students and to junior and high school students. 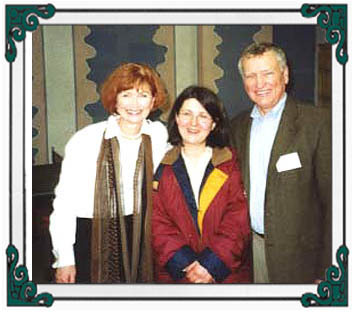 Dolley with (L-R) Vasim Lliade, Ance, Julia. An entire Ukrainian family who came to know Christ! 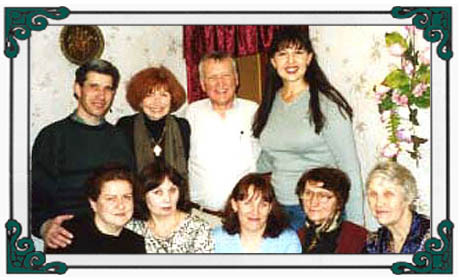 On our last trip in 2004 we served at orphanages, hospitals, and a day center where young boys who live beneath the streets of Kiev can come for food, a hot shower and loving care. Ukraine missions also bring us to the infirmed and their families, with provision of food and clothing. Some of our treasured memories are the parties for the children. We connected with them through simple decorations, food, songs, messages and sweet one on one fellowship. At one Singles Conference accessing my classroom required going down stairways of the church, outside, into the University next door and up 3 flights of stairs. I can still hear my footsteps echoing in that stairwell and feel the sudden awareness that the hand of God had carried me all the way there to serve Him. I flew up those stairs, my entire being filled with joy as I walked toward my class of 125 young people. Each session, we could hardly wait to return to each other with warm greetings, laughter, questions and testimonies. The introductions humbling as each participant spoke of how he/she was seeking Christ or came to Him, their church and ministry, all of this always before the mention of vocation or personal accomplishment. "Refiner's Fire" took place as their godly priorities humbled me. As I shared what the Lord had put on my heart, His Word and unconditional love offered hope to those eager and hungry for Truth. "I thank my God every time I remember (you) our Ukrainian brothers and sisters." They inspire me and I'm outrageously blessed by each and every one.